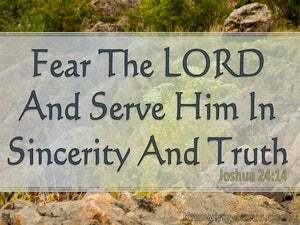 ﻿ Joshua 24:14 "Now, therefore, fear the LORD and serve Him in sincerity and truth; and put away the gods which your fathers served beyond the River and in Egypt, and serve the LORD. "Therefore, fear the Lord and worship Him in sincerity and truth. Get rid of the gods your ancestors worshiped beyond the Euphrates River and in Egypt, and worship the Lord. "Now you must fear the LORD and serve him in faithfulness and truth. Throw away the gods that your ancestors served beyond the Euphrates River and in Egypt. Instead, serve the LORD. 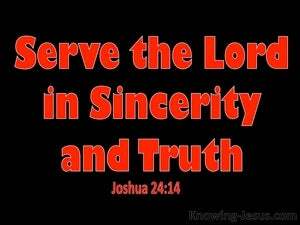 Now therefore fear LORD, and serve him in sincerity and in truth. And put away the gods which your fathers served beyond the River, and in Egypt, and serve ye LORD. Now therefore fear Jehovah, and serve him in sincerity and in truth; and put away the gods which your fathers served beyond the River, and in Egypt; and serve ye Jehovah. Now therefore, [reverently] fear the Lord and serve Him in sincerity and in truth; put away the gods which your fathers served on the other side of the [Euphrates] River and in Egypt, and serve the Lord. So now, go in fear of the Lord, and be his servants with true hearts: put away the gods worshipped by your fathers across the River and in Egypt, and be servants of the Lord. And now fear Jehovah and serve him in perfectness and in truth; and put away the gods which your fathers served on the other side of the river, and in Egypt; and serve Jehovah. Now therefore fear the LORD and serve him in perfection and in truth and put away from among you the gods which your fathers served on the other side of the river and in Egypt, and serve ye the LORD. And, now fear ye Jehovah and serve him in uprightness and in truth; and remove the gods which your fathers served beyond the river and in Egypt; and serve ye Jehovah. Now therefore fear the LORD, and serve him in sincerity and in truth: and put away the gods which your fathers served on the other side of the River, and in Egypt; and serve you the LORD. "So now, revere Yahweh and serve him in sincerity and faithfulness; remove the gods that your ancestors served beyond the river and in Egypt, and serve Yahweh. 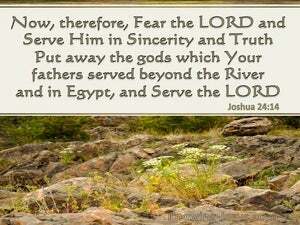 Now, then, fear Jehovah, and serve Him in sincerity and truth. And put away the gods which your fathers served on the other side of the flood, and in Egypt, and serve Jehovah. And now, fear the LORD and serve him in pureness and truth: And put away the gods which your fathers served on the other side of the water, and in Egypt, and serve the LORD. Now obey the Lord and worship him with integrity and loyalty. Put aside the gods your ancestors worshiped beyond the Euphrates and in Egypt and worship the Lord. 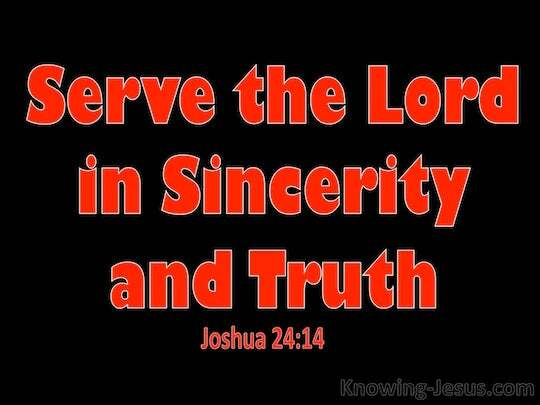 Now therefore fear the LORD, and serve him in sincerity and in truth. Put away the gods which your fathers served beyond the River, in Egypt; and serve the LORD. Now, therefore, revere ye Yahweh, and serve him, in sincerity and in truth, - and put away the gods which your fathers served beyond the River, and in Egypt, and serve ye Yahweh. Now therefore fear the LORD, and serve him in sincerity and in truth; and put away the gods which your fathers served on the other side of the flood, and in Egypt; and serve ye the LORD. 13 'I gave you a land on which you had not labored, and cities which you had not built, and you have lived in them; you are eating of vineyards and olive groves which you did not plant.' 14 "Now, therefore, fear the LORD and serve Him in sincerity and truth; and put away the gods which your fathers served beyond the River and in Egypt, and serve the LORD. 15 "If it is disagreeable in your sight to serve the LORD, choose for yourselves today whom you will serve: whether the gods which your fathers served which were beyond the River, or the gods of the Amorites in whose land you are living; but as for me and my house, we will serve the LORD." May my heart be blameless in Your statutes, So that I will not be ashamed. "I said to their children in the wilderness, 'Do not walk in the statutes of your fathers or keep their ordinances or defile yourselves with their idols.